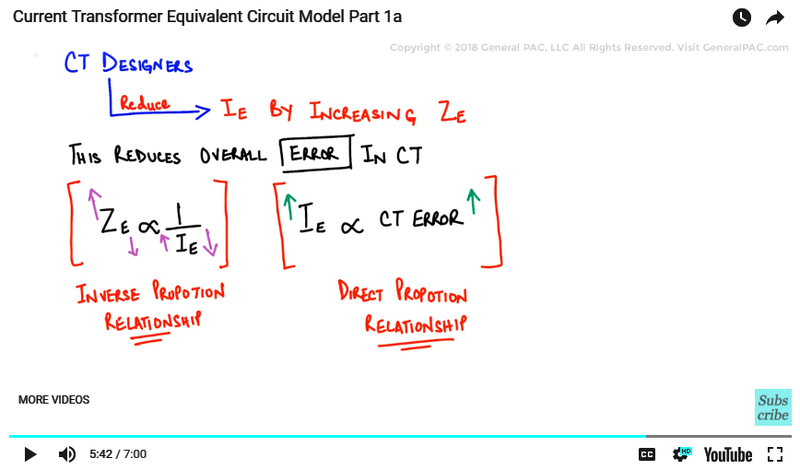 In part 1a of the series, we shall explain the important parameters of a Current Transformer, when it comes to its equivalent circuit model, and we go through this in much greater detail. 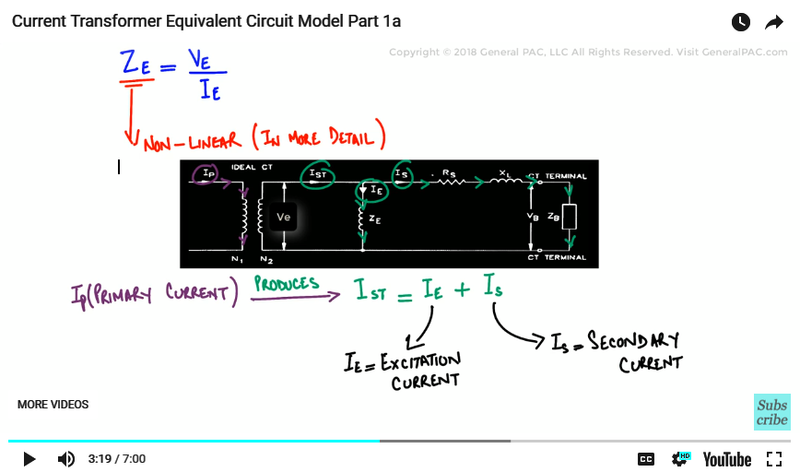 The equivalent circuit model and its important parameters were briefly discussed in the previous video series called the “Brief Introduction to Current Transformers & its applications”. Please follow the link in the description section below. If you haven’t watched this already, we will recommend that you watch it and view it before going through this particular tutorial. It’s such a really good foundation and it helps to describe some of the concepts that are shown in this tutorial. 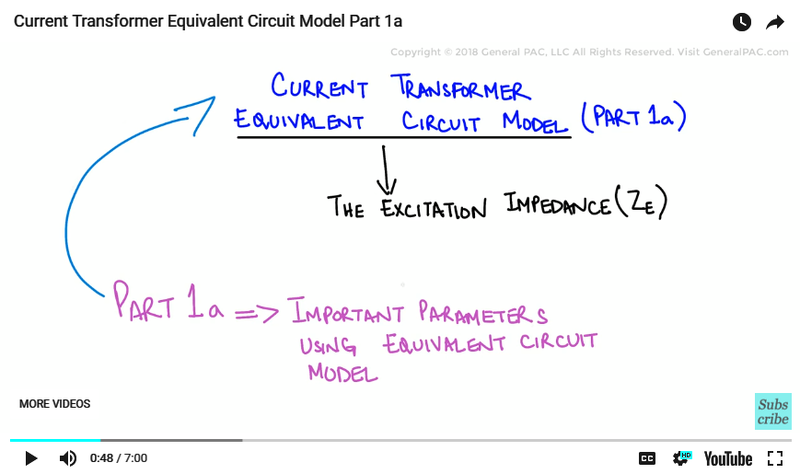 Let us now review the equivalent model, the simplified equivalent circuit model of a current transformer in detail and discuss each parameter to a great extent. 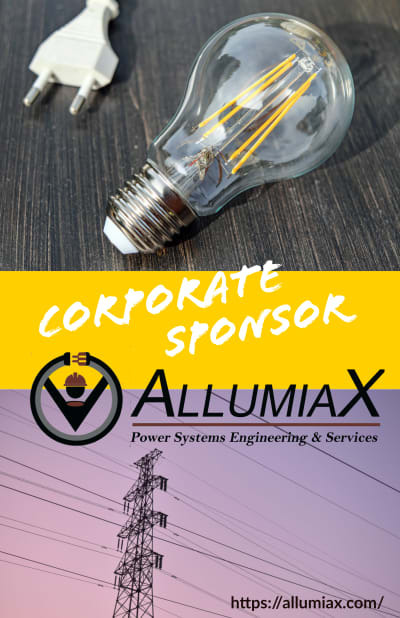 Now, we shall start with the excitation impedance & the excitation current which is critical for analyzing the overall behavior of a current transformer. So this equivalent circuit model of this CT is drawn as you can see on the screen. There is an Excitation impedance which we will represent by ZE, it tells us about the magnetization behavior of the CT core and this ZE branch or the ZE value or the excitation branch. It is non-linear in nature, which means that this impedance changes as the CT saturates and it results in a varying secondary excitation voltage, VE. The varying excitation as well as the varying excitation branch current, IE. And ZE is a no-linear value. We will go over this in much more detail in this tutorial. 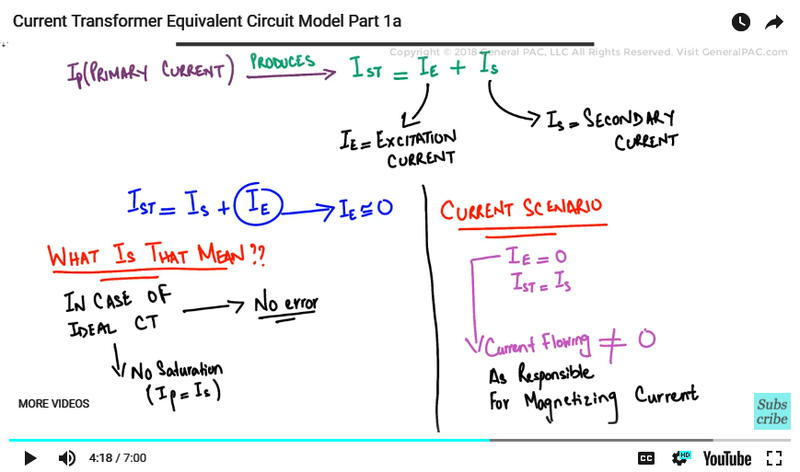 Now, the total secondary current as shown by IST, is equal to the secondary current only, when IE is equals to zero. Now, what is that mean?? What we are trying to say here is that if we model the ideal current transformer, where there is no error or there is no saturation, where the primary current is equal to the secondary current. In this case, we are saying that IE is zero and IST is equal to Is . IE is zero or is a negligible value. So Practically speaking, IE – the current flowing through the magnetization branch cannot be equal to zero because it is responsible for producing the magnetizing current in a current transformer, and that is required for it to operate (in a practical sense) but it can be minimized by increasing the value of the excitation impedance “ZE “. So CT designers can reduce the magnetization current IE by increasing the excitation impedance ZE and therefore reduce the overall error or the overall chances of the CT becomes saturated. Now the value of ZE that is inversely proportional to the excitation current. So if ZE is high, then the excitation current will be low. And if ZE is low, then the excitation current will be high. The excitation current is also directly proportional to the CT error, therefore, the greater the excitation current, the greater the CT Error, then how we will represent this mathematically. So this is an inverse proportional relationship, if one goes up, the other goes down and vice versa and IE – the excitation current is directly proportional to the CT error, so if one goes up, the other goes up and one goes down, the other goes down. Perfect. Keep in mind that the Protection Class and Metering Class Current Transformers should be designed so that ZE is of high value. This is required to minimize the total amount of CT error. And, if the value of ZE is high, the excitation current flowing through the magnetization branch will be negligible – meaning it will be very small. This way, the excitation current will be low, and so will the ratio error or the CT error produced by the current transformer. In part 1b, we will go over to the CT excitation current and the excitation curve in more detail. We hope this topic and series is enjoyable and enlightening for students and professionals. If you find this content useful, please consider subscribing to GeneralPac.com and becoming our patron… supporting us through patreon.com/GeneralPAC. We make power systems intuitive. Thank you.